An end-of-the-world cataclysm in vades Van Gogh's "Starry Night", one of apocalypse filled with melting aerolites and comets adrift. One has the impression that the artist has expelled his inner conflict onto a canvas. Everything here is brewed in a huge cosmic fusion, as in the nebulae painted by William Blake. The sole exception is the village in the foreground with its architectural elements. While giving free rein to his wild imagination, Van Gogh recalled his childhood and youth. In his article written in 1890 Albert Aurier spoke of "a kind of drunken giant, better able to move mountains than to handle bibelots, an ebullient brain which irresistibly pours its lava into all the ravines of art." 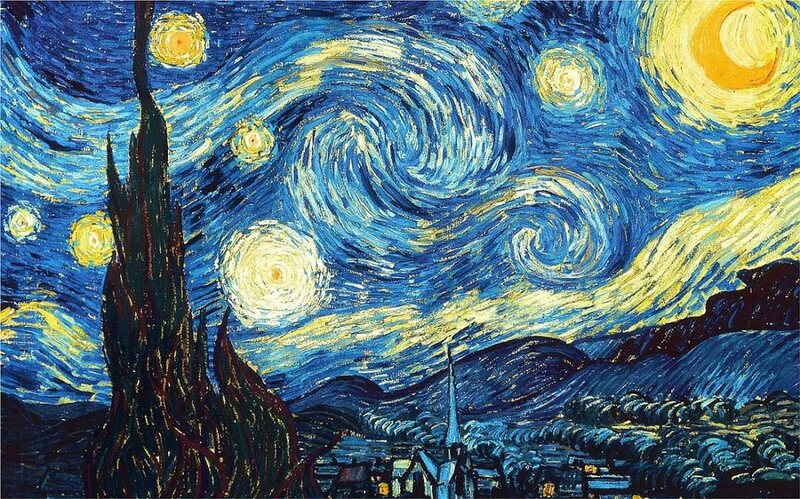 To which Van Gogh replied several months after painting "Starry Night," ". . . the emotions which seize me when I am confronted with nature sometimes produce fainting spells, and then the result is a fortnight during which I am incapable of working." On the left of the composition the dark mass of the cypress tree rises to the sky. "I have always been preoccupied by cypresses," wrote Van Gogh in June, 1889. "Their lines and proportions are as handsome as an Egyptian obelisk. And the dark green has such a distinguished quality. It is the dark note in a sunny landscape, but it is one of the most interesting dark notes, the most difficult to hit just right, that I can imagine."